Need a little tranquility in life? Try the Sharper Sim Foot Massager! Stuffed with pristine goose down for maximum comfort and full of fantastic fun, this stylish chair brings home all the benefits of the spa but without the addition of athlete's foot! 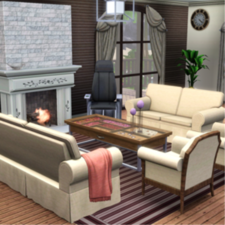 Now your Sims can experience the comforts and benefits of a day spa in their own living room! Let your Sims relax in style with the Sharper Sim Foot Massage Chair.